Since its inception Gi.Gi.Esse has dedicated itself to the continuous improvement of quality and services provided. In these years it has achieved excellence because it has always been committed to transmitting to its employees the mentality of attention to the needs of the customer, to develop an awareness of prevention and give added value to its activities. Having successfully passed the certification process, Gi.Gi.Esse has thus obtained the ISO 9001: 2015 Certification from TÜV InterCert Srl - Group of TÜV Saarland which has certified that "the management system of the organization has been evaluated and judged to be compliant to the requirements of the standard "in the field of application of" Mechanical processing for third parties and production of small metal parts ". 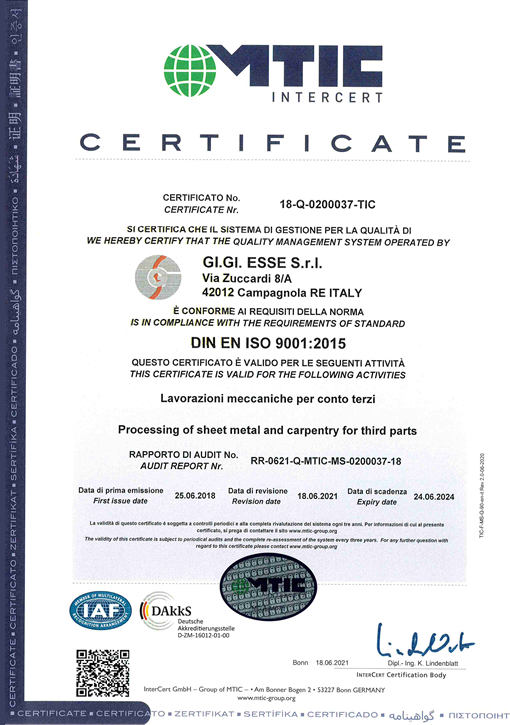 Gi.Gi.Esse considers itself very proud of the achievements achieved with so much effort and dedication that it will commit itself, even in the coming years, to maintaining these high quality standards.